Powers: Daredevil has the speed, agility and strength of a man in peak physical condition. Due to having been kept in suspended animation with super powered individuals, Daredevil no longer ages. Bart Hill was the son of a wealthy land owner, one of his properties being a gold mine located in Australia. Bart was taken as an infant to this country where his parents were murdered by his step-uncle and he survived purely due to being raised by a tribe of native pygmies. He learned numerous fighting and acrobatic skills before heading back to the United States where he avenged his parents’ deaths as the vigilante Daredevil. Daredevil went on to become one of the most recognisable heroes of World War II where he fought against the Nazi threat. Daredevil became the guardian of a group of kids known as the Little Wise Guys who became his sidekicks and constant companions. On one of their adventures the group were abducted by Solar Man. This hero was desperate to increase his power levels and so he captured many of his peers and locked them away in a device hidden within his Citadel of Seclusion headquarters. This chamber converted its occupants into energy that then fed Solar Man, augmenting his abilities. When the new Dart was injured during a fight with Dragon she ended up getting washed out into sewage water. 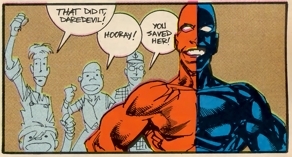 Dart was discovered by Daredevil and the Little Wise Guys who took her to their clubhouse so that she could recover, the villain pretending that she had no recollection of her past life. Jock stayed home from school to take care of Dart one day and stumbled across her true identity. Dart reacted instantly by brutally killing the youngster and disposing of his corpse. Dart kept this murder a secret as she and Daredevil started a relationship with one another. When Dart’s true nature was exposed, Daredevil had no choice but to apprehend his lover and turn her over to the authorities. He has since struck up a close friendship with Angel Dragon and when he was injured fighting Emperor Kurr, Angel gave Daredevil a dose of her blood to help him recover from almost certain paralysis. However, he discovers that Angel has feelings for him, but tells her that he can’t return the same ones to her. Daredevil later visits Angel on her 16th birthday party, but ends up freaking her out as she was unable to regonize him without his costume. Later, Silver Streak reveals to Daredevil that the blood transfusion given to him by Angel has made him better than ever. Daredevil later tries to approach Angel during Malcolm’s graduation, but she is rude to him and brushes him aside. He doesn’t understand what he could have done. Later, during a battle with Glum and Angels alternate he throws a sharp boomerang at the alternate Angel, hurting her deeply. Angel furious, begins to choke Daredevil telling him that he always makes things worse, until Malcolm calms her down and she releases him. There are no hard feelings as he helps Angel up after she is injured by the Absorbanoids. He later fights OverLord III and is losing until Malcolm and Angel show up. After OverLord is defeated by Dragon, Daredevil leaves the scene. A bit later, the Little Wise Guys inform Daredevil that his arch enemy, the Claw is now among the living and is attacking a Vicious Circle stronghold. Daredevil goes right after the Claw, but is quickly defeated. Angel is also at the scene and she finally makes a move on Daredevil and kisses him on the lips. However, she is leaving for Washington D.C. to join the S.O.S. and Daredevil’s pleas for her to stay in Chicago fall on deaf ears as she still decides to leave. While a discussion between Daredevil, Malcolm, and the Little Wise Guys, they are spied on by Dart who overhears that the Little Wise Guys are immortal due to their blood. She kidnaps and brutally murders them which Daredevil believes was done by the Claw. During the Claw’s invasion of Chicago, Daredevil murders the Claw decapitating him via boomerang. With the Little Wise Guys dead, Daredevil leaves Chicago and heads to join the S.O.S. in Washington D.C. He later commences in a relationship with Angel, but it doesn’t last long as she breaks up with him and decides that she wants to move back to Chicago.